Home » News » Uncategorized » Radiothon a Success! 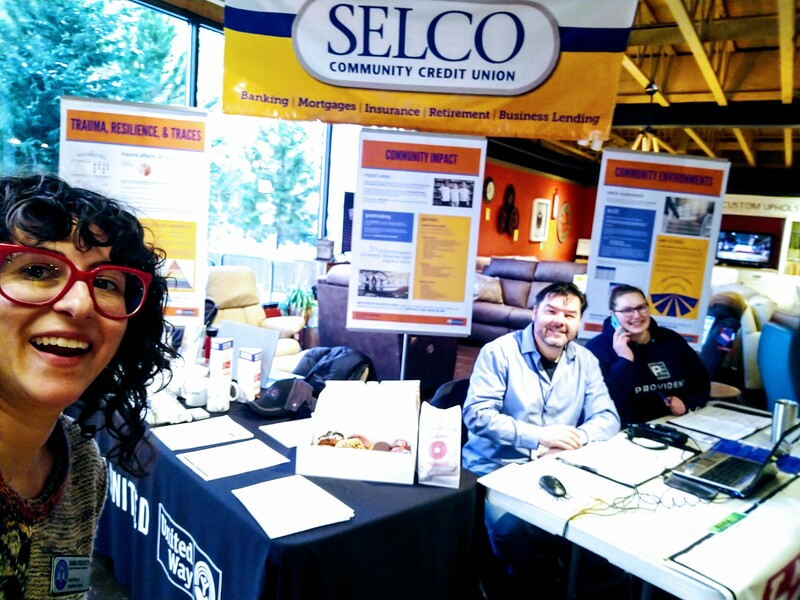 We raised $11,635 at our Selco – United Way Radiothon on February 22! And, we had 3 people sign up for OVER THE EDGE! DJs from Horizon Broadcasting Group radio stations KQAK 105.7 and The Peak 104.1 were broadcasting live from M. Jacobs Fine Furniture all day on 2/22. The fundraiser, presented by Selco Community Credit Union, helped us fight for the health, education, financial stability and resilience of every person in our Central Oregon community. The Radiothon was also sponsored by Edward Jones Investments Financial Advisor Kate Gaughan and Central Electric Cooperative. Programming over the day focused on our work on local challenges such as access to basic needs (like food, shelter, and healthcare), safety, childhood development, childhood trauma, homelessness, food security, housing, child care, health services, mentoring, and foster care. Programming also focused on our inaugural OVER THE EDGE fundraiser, which will offer participants the opportunity to raise funds for United Way in order to rappel off of the roof of the Oxford Hotel – Bend’s tallest building. Funds raised during the Radiothon support our focus on reducing childhood trauma and building resilient individuals, families, and community. Since 1953, we have focused on health, education, and financial stability as the foundation of well-being and opportunity, along with basic needs. As we continue to focus on these causes, we are also working upstream to tackle childhood trauma and to build resilience. Resilience refers to the combination of individual skills and perspectives, social connectedness, and community resources that define the ability to manage stress, bounce back from hardship, and thrive in the face of adversity. Traumatic experiences early in life disrupt development and can lead to behavioral, mental, and health challenges later in life, contributing to decreased academic attainment, lost productivity, and negative health outcomes, like diabetes, heart disease, cancer, obesity, asthma, and more. Our work focuses on childhood trauma as a root cause of many issues faced by members of our community, and cultivating and building resilience, which has been proven to offset the negative effects of childhood trauma through TRACEs (Trauma, Resilience, and Adverse Childhood Experiences) – a community-wide movement made up of 80 entities, with a goal of dramatically improving the health and well-being of our community by addressing childhood trauma as a root cause of regional health issues. TRACEs has 2 target populations: children and youth experiencing foster care, and the child care availability and affordability crisis.